We are officially ready for Easter. 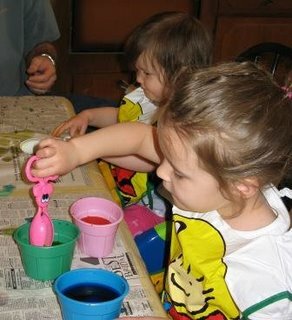 Today we covered the table in newspaper, put paint smocks on the girls and dyed Easter eggs. I have to say that J is too young for this activity. There was a LOT of screaming on her part because she wanted to do it herself, but couldn't work the tongs very well to keep a hold of the eggs and we were afraid she was going to spill the dye everywhere. As of Tuesday, J is officially over her breathing problems and her coughing is much much better. YEAH! Tonight we went out to eat at Sonic. I was very surprised at how well J sat at the picnic table and ate her dinner without a problem. M got up and down more than J did. This week was "Week of the Young Child" at daycare so each day the kids wore something special, hats on Monday, pajamas on Tuesday, school colors on Wednesday, mis-matched cloths on Thursday and cardinals gear today. M had a lot of fun with this especially getting to wear her pjs to school and mis-match day which she often participates in all on her own. She loves to pick out her own crazy, mismatched, outfits! Oh, and I forgot to mention... G got the new lights up in the kitchen already. They are much brighter and more modern than the old ones and I love them!